Amaryl is an oral blood sugar-lowering drug that is used to treat patients with type 2 diabetes. It contains the active ingredient glimepiride and belongs to the sulphonylurea class of diabetes medicines, which work by boosting the secretion of natural insulin and increasing the body’s sensitivity to the blood sugar-regulating hormone. Amaryl helps reduce the amount of glucose in your blood by stimulating the release of insulin from the pancreas into the blood and encouraging the use of sugar in your blood by the cells that need it. Who is Amaryl suitable for? Amaryl is indicated for treatment of adults with type 2 diabetes who are unable to achieve glycemic (blood glucose) control through diet and exercise alone. Amaryl can be taken on its own (monotherapy) or in combination with metformin (sitagliptin) or insulin when these have not proved effective enough on their own. As with any drug, Amaryl is not suitable for everyone - some people should never use it while others should only use it with special care. Amaryl tablets are available in 1mg, 2mg, 3mg and 4mg doses. Normally a single daily dose of glimepiride is sufficient, and it is recommended that this dose be taken whole with some liquid shortly before or during breakfast or - if you skip breakfast - shortly before or during your first main meal. Your GP will determine the dose and frequency of dosage depending on your blood sugar levels, and these instructions will be printed on the dispensing label attached to your medication. If you forget to take a dose, start your medication regimen again with your next meal. Do not take increase your dose to make up for a missed one. Glimepiride tablets should always be kept in the original container and stored at room temperature. You must also make sure the medicine is kept out of the sight and reach of children. Please note this is not a complete list of side effects and others may occur. A full list can be found in the patient information leaflet that is enclosed with the medication. Taking more doses of some medicines than stated in the instructions can be harmful. In case of an overdose, you should seek emergency medical attention. 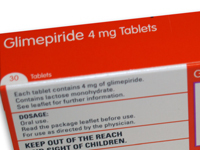 There are a number of different types of medicines that may interact with glimepiride. Some of these may reverse the action of Amaryl, while others that have the same blood sugar-lowering effect may increase the risk of hypoglycaemia. Please note this is not a comprehensive list and other types of medication may affect the action of glimepiride. If you are taking any of medications listed above, speak with your doctor or pharmacist. Depending on your specific circumstances, your doctor may want to adjust the dose of one or both of the medications; change one of the medications to another; or stop one of the drug treatments.